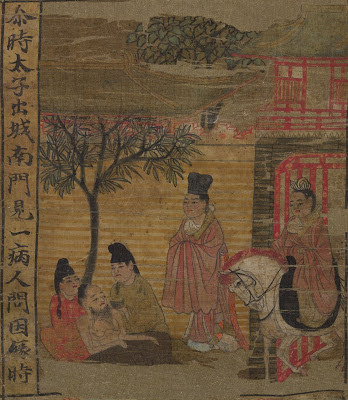 Here we see the prince exiting the south gate on horseback and encountering an ill man. The artist made no attempt to portray the setting or prince as Indian. We can really only speculate why, but I assume it was because the artist was unfamiliar with contemporary Indians and just naturally portrayed the setting and characters as he or she could visualize them. The other images in the set are done in a similar manner. 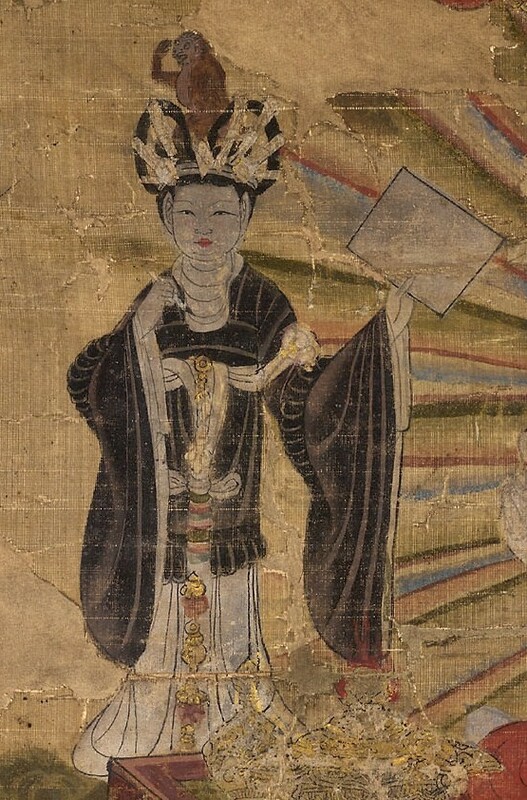 However, not all Buddhist art from the Tang Dynasty is like this. Here I want to take a look at some other examples from Dunhuang and show that some artists knew what an Indian looked like. The following piece is "Tejaprabhā Buddha and the Five Planets" from Qianning 乾寧四年 (897 CE) 熾盛光佛并五星圖 by Zhang Huai Xing 張淮興. 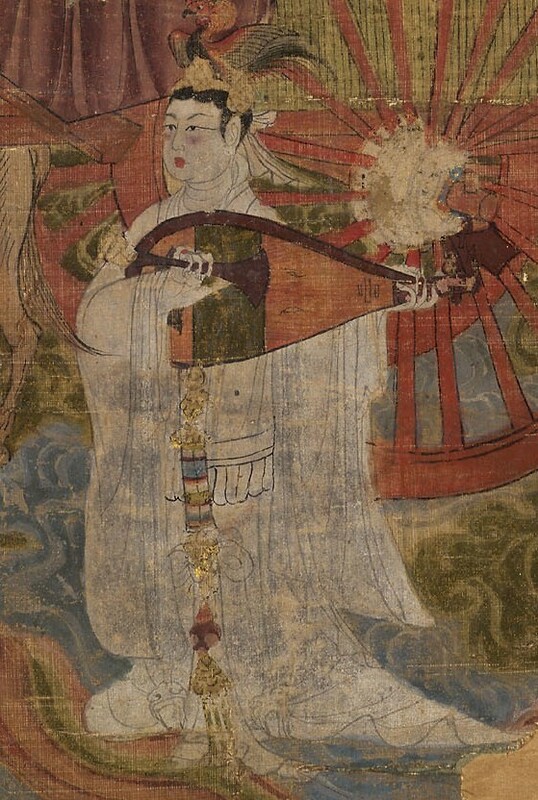 The planets as depicted here are largely identical to what is described in the astrological text the Brahma Horanavagraha 梵天火羅九曜, as translated by Yijing 一行 (683-727). 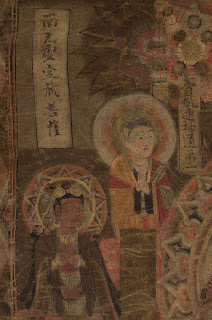 Consequently, it is assumed that the shadow planets Rāhu and Ketu might have a part in this because there are supposed to be nine luminaries (five planets, sun, moon and the two shadow planets), but due to damage their depictions might have been lost. Yijing incidentally was an esoteric monk who studied of Śubhakarasiṃha 善無畏 and Vajrabodhi 金剛智. He was adept in mathematics and astrology and calendrical sciences. You will notice in the bottom left a certain figure noticeably different in skin tone from the others. 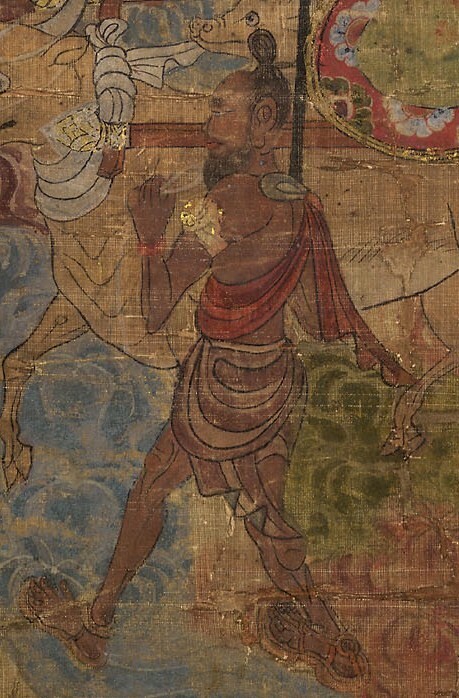 He is a Brahmin depicting Saturn, carrying a staff and directing the ox. Atop him is an ox head. His garments, hairstyle, footwear and adornments are likewise different. Here is what appears to be a realistic portrayal of a figure from the subcontinent. 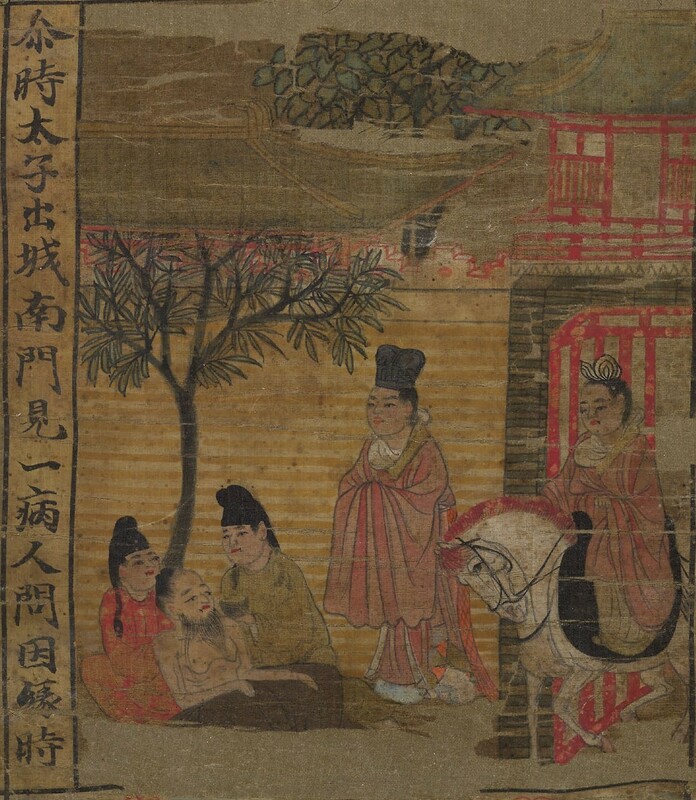 Three of his companions are dressed in Chinese garb. 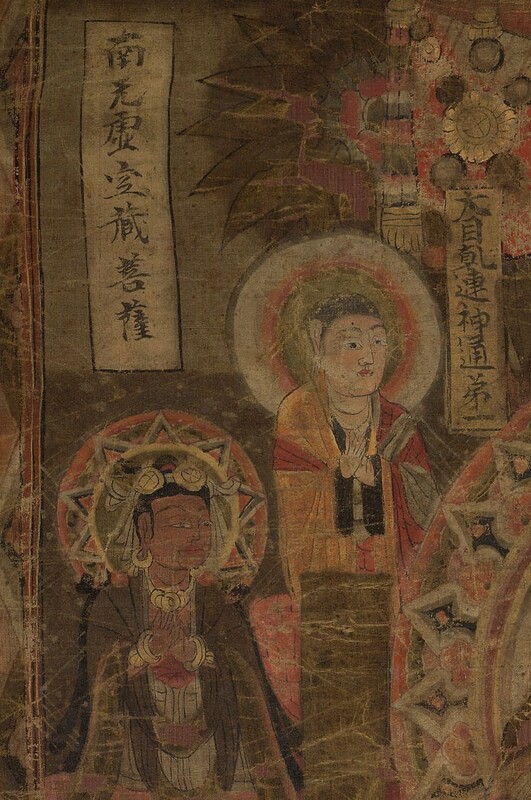 We might also compare these images to what is preserved in the Taishō (T.1311). 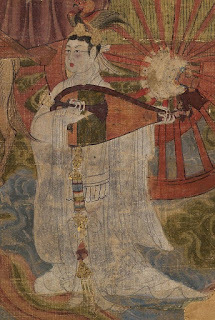 The female figure on the bottom is Venus depicted as a beautiful lady playing the pipa 琵琶. Her skin tone is snow white. Incidentally it was part of the female aesthetic which was transferred to Japan and emulated by the Geishas. She has a bird hat atop her head. 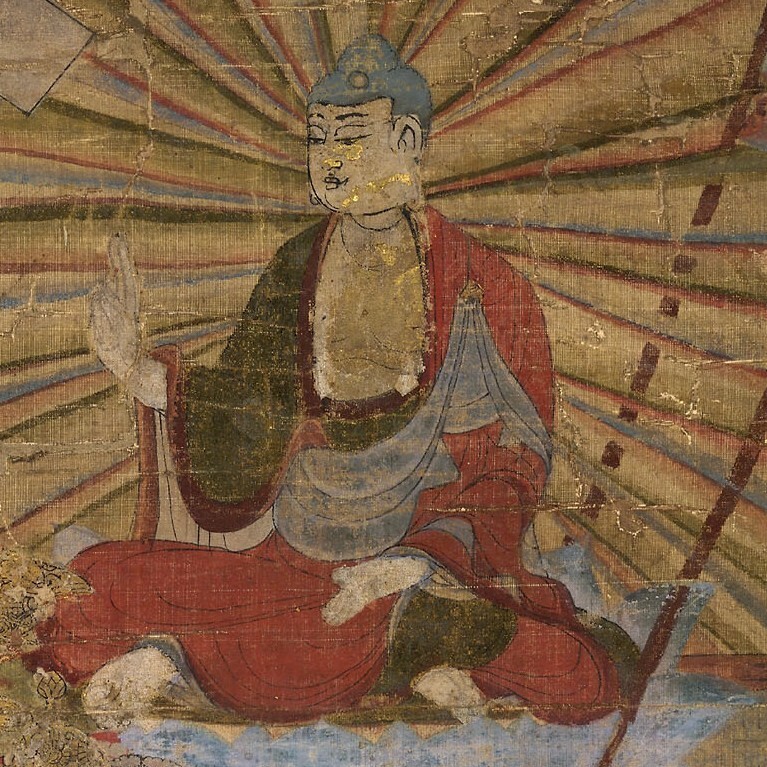 Tejaprabhā Buddha naturally is depicted as a proper buddha complete with radiant golden skin (it seems the gold leaf has largely worn away) and uṣṇīṣa (on the crown of his head). He too is wearing Indian garb. While the symbolism in this work is quite rich, I think one notable feature is how the Brahmin is portrayed as an actual Indian. The artist made a conscious effort to depict this in contrast to the first image we viewed where Prince Gautama is seen as a Chinese prince. Either he was working from existing examples or he quite possibly had seen travellers from the subcontinent. Here is another piece consciously depicting a non-Chinese ethnicity. 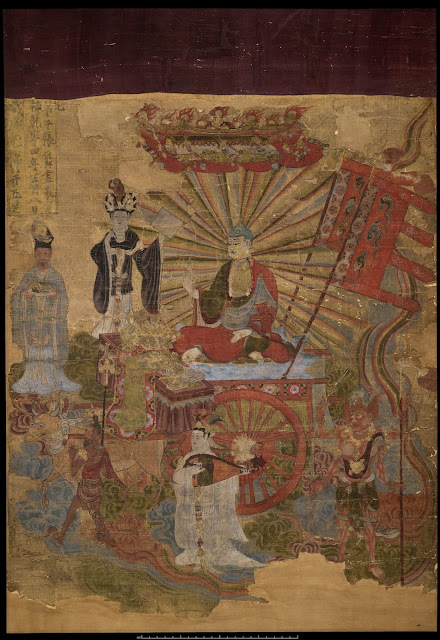 From upper left to right the figures include Ākāśagarbha 虛空藏菩薩, Mahāmaudgalyāyana 大目揵連 (foremost in supermundane abilities), the Buddha, Śāriputra 舍利弗 (foremost in wisdom) and what appears to be "Treasure Virtue Bodhisattva" 寳德菩薩. 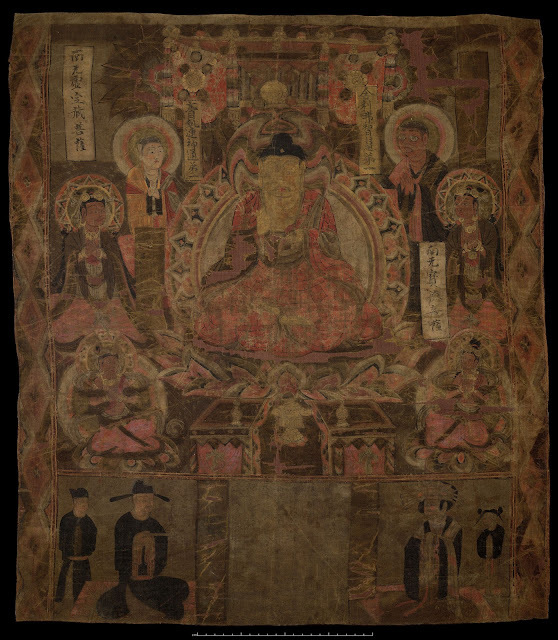 Below them all are two more Indian figures and beneath them are lay devotees dressed in Chinese attire. What is notable here is that Mahāmaudgalyāyana is quite fair while his companions are darker in their complexions. 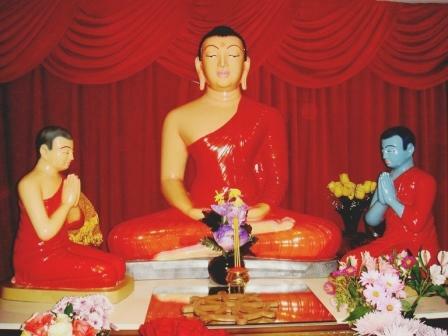 I do not precisely know why this is, but one source tells me that in the Sri Lanka tradition he (Pāli: Moggallāna) is normally portrayed as blue, which is according to the Buddhavaṃsa 1.58 (see here). It seems the artist in the above painting was under a similar impression, but the colour was different. Perhaps someone can clarify this for me. 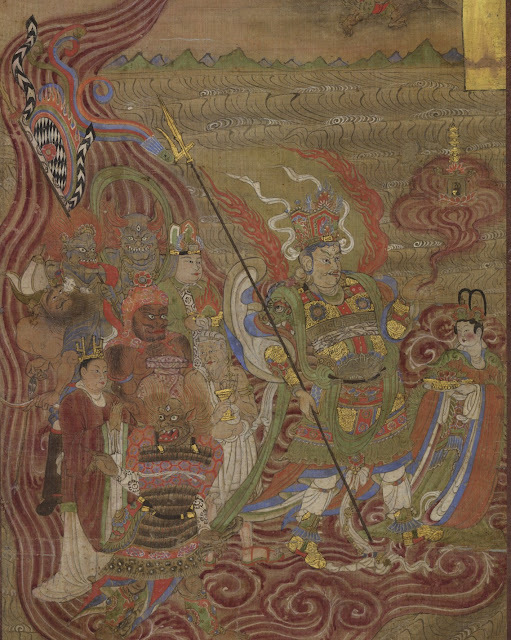 Quite often in ancient Chinese art Indian deities lose their original identity and are portrayed as Chinese complete with the regalia and entourage. 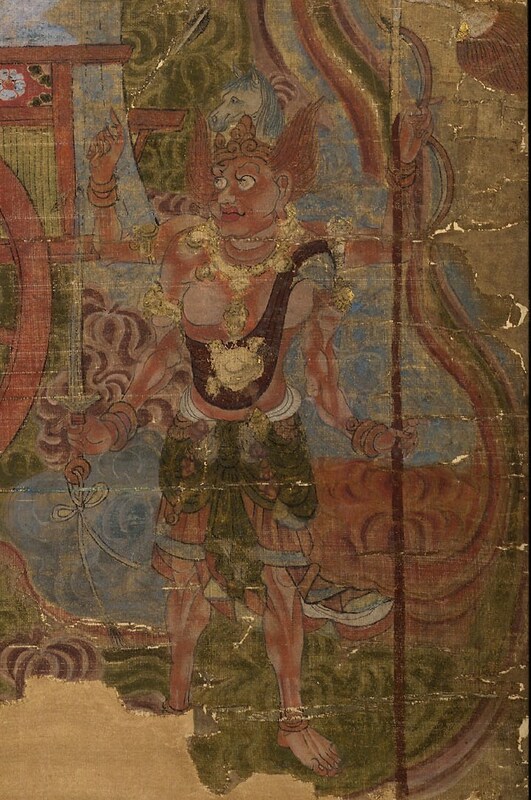 One last image we will look at here is Vaiśravaṇa 多聞天 (Mahārāja of the north continent Uttarakuru) and his entourage, which includes yakṣas and rākṣasas (see here for some related information), crossing the waters. For a few more interesting images see an earlier post Six Female Spirits to Protect Children.